TWO goals in the space of a minute shortly after the start of the second half allowed this quality-lacking 2. Bundesliga contest between St Pauli and Ingolstadt to finish level. While the home side did most of the attacking, with Ingolstadt looking to play on the break, consistently terrible finishing and woeful passing in the final-third cost St Pauli any hope of winning this game. They fell behind in the 55th minute when the lively Caiuby crossed for Christian Eigler to score at the near post. A minute later, though, Ingolstadt ruined all the good work they had done defensively up to that point by allowing home debutant Florian Moht a free header to make it 1-1. Coach Tomas Oral seemingly played for a point at the Millerntor-Stadion, so will probably be happier than his opposite number André Schubert, who has already stated his intention to bring more quality players to St Pauli before the transfer window closes. His side and Oral’s have now drawn both of their 2012/13 2. Bundesliga games, and the two coaches will be hoping ties against regional sides in the cup next weekend will give their respective players a chance to sample what winning feels like. INGOLSTADT will attempt to bounce back from throwing away a two-goal lead on the opening day of the 2012/13 2. Bundesliga season as they travel to St Pauli this weekend. Both teams have made significant changes to their squads over the summer, meaning that the scouts from either club will have had their work cut out preparing dossiers for their respective team’s coaches this weekend. Only four of the players who started in St Pauli’s final game of the 2011/12 season featured in last Friday’s 0-0 draw at Aue, for instance. The general first half formations. Robin Dutt finally won his first game as Bayer Leverkusen manager as the home side scored a late winner in what had been an even and entertaining game. These two attack-minded sides dominated one another in separate spells throughout the 90 minutes, with both goalkeepers on top form to keep the game scoreless. But a moment of brilliant athleticism by Simon Rolfes in the 86th minute saw the Bremen defence caught off-guard and a deserved point cruelly snatched from their grasp. 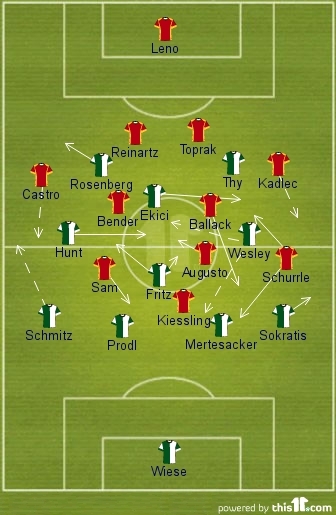 Bremen, lining up with near enough the same 4-4-2 midfield diamond and players that contested the victory over Kaiserslautern last week, got us under way at the BayArena, where the hosts had made changes in goal, defence, midfield and up front. The opening stages were keenly and evenly contested, Stefan Kießling in particular embodying the home side’s fight; a quality lacking in recent weeks.